The SGD Group is the formation of specialist businesses that have a strong synergy including both operating approach and services offered. With the rapid development of technologies we have seen a huge crossover of industry sectors, specifically electronic ﬁre and security systems with the information technology (I.T) sector. Within the SGD Group all of our individual businesses share the same 'customer first' approach and goal of 'providing the best possible service and highest level of customer satisfaction' . SGD Security Ltd - A well established, independent security company that has been trading for over 22 years. 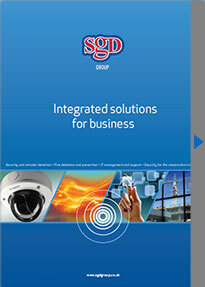 SGD Security Ltd are also able to provide complete network cabling solutions. Operating from South Wales but able to provide a National Service. SGD Guarding - A company specialising in all aspects of guarding including manned guards, security guards and keyholding across South Wales and Bristol. ADC Fire Systems - A specialist fire company with an excellent reputation. The company was formed by the merger of two well established companies ADC Fire Systems Ltd and SGD Security Ltd (Fire Division) , giving the amalgamated company the knowledge and expertise of 50 years trading. Alternatively click here to download a pdf version of our brochure.